Putin’s new armored corps delineates a clear break with Soviet-era legacy weapon systems. 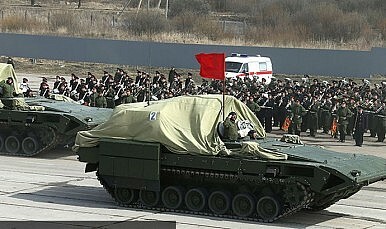 The Russian Ministry of Defense (MoD) has for the first time officially revealed the Russian Ground Forces’ most advanced armored fighting vehicles, including a brand new main-battle tank, self-propelled artillery, and new armored personnel carrier, ahead of the May 9 Moscow Victory Day Parade (see: “‘Arma Virumque Cano’ – Parades and Militarism in Asia”). It is important to not that the recently published photos on the Russian MoD’s website revealed prospective military hardware not yet commissioned into the Russian Armed Forces. Additionally, the vehicles displayed on the images have all their their weapon systems covered, which makes the initial analysis of the equipment highly speculative. 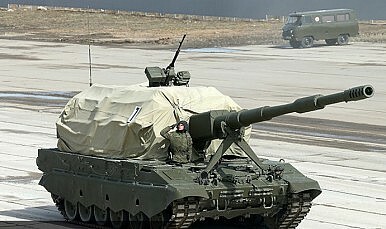 “During the May 9 parade in Blagoveshchensk we will be showcasing for the first time the latest types of arms and military hardware the Eastern Military District received last year and this, including a BTR-80 tactical unit control complex, a BTR-82 amphibious armored vehicle, Patriot armored cars, and modernized Ural heavy trucks,” EMD media spokesman Alexander Gordeyev told Sputnik News. From a military technology perspective, the new armored fleet delineates in many ways a break with old Soviet-era military hardware. “The new vehicles are principally clean-slate designs and represent the biggest change in Russia’s armored fighting vehicle families since the 1960s and 1970s,” IHS Jane’s Defense Weekly reports. 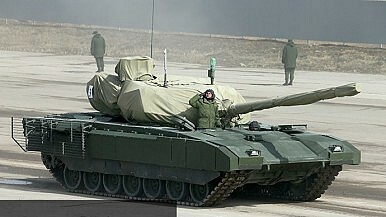 The crown jewel of Moscow’s future tank force is the T-14 main battle tank (MBT) based upon the new “Armata” universal chassis system. The T-14 Armata’s key feature is its unmanned remotely controlled turret (see: “Putin’s New ‘Wunderwaffe’: The World’s Deadliest Tank?”), and the location of the crew in an armored capsule in the forward portion of the hull. “The tank mounted on the Armata platform will be the main battle tank of the Russian Ground Forces boasting brand new performance characteristics and a new ammunition feed system,” the caption on the ministry’s’ website reads, according to Interfax. The Russian military intends to replace 70 percent of its tank corps with the new tracked vehicle and plans to produce 2,300 T-14 Armata models by 2020. Additionally, as I reported before, the Russian military envisions the universal Armata chassis system as a platform for as many as 13 different tracked vehicles, including a self-propelled artillery platform, an armored military engineering vehicle, and an armored personal carrier. [T]his IFV variant is understood to be armed with a KBP Instrument Design Bureau Epoch Almaty remote control turret (RCT) armed with a 30 mm 2A42 cannon, 7.62 mm coaxial MG, and a bank of two Kornet-EM anti-tank guided weapons (ATGWs) on either side. Other vehicles featuring the Armata chassis include the MT-A armured bridgelayer, MYM-A engineering vehicle, BMO-2 thermobaric multiple rocket launcher variant, and USM-1 minelayer, IHS Jane’s Defense Weekly says. Additionally, the pictures revealed Russia’s new replacement of its unique BMP series, the Kurganets-25 ,a hybrid vehicle between an armored personnel carrier (APC) and a light tank. Also on display, was the successor of the BRT-series, the wheeled Bumerang (Boomerang) 8×8 infantry fighting vehicle. As I stated before, the initial reports on these weapon systems have to to be taken with a grain of salt, and until the vehicles has been thoroughly examined in action, we will know very little about their genuine capabilities. Putin’s New 'Wunderwaffe': The World’s Deadliest Tank? Why tankers in the West should be worried about Moscow's new armor. Is Russia's Deadliest Tank Already in Serial Production?Will 3D Printing Speedup Production of Russia’s ‘Deadliest Tank’?Waging War Is Still Good Business in RussiaIs 'Russia’s Deadliest Tank' Really Invisible to the Enemy? Is the 'World’s Deadliest Tank' Bankrupting Russia?